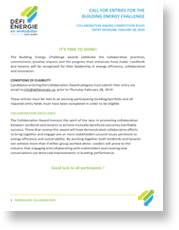 EVERTHING YOU NEED TO SUCCEED IN THE BUILDING ENERGY CHALLENGE! We are here to help you succeed. We’ve assembled a number of resources that can provide support and assistance as you participate in the BEC. The Participant’s Kit will be available in the Participants Zone once you have completed registration and shared your building on ENERGY STAR. The kit includes concrete resources for implementing your energy-saving measures, and marketing tools to promote your accomplishments. 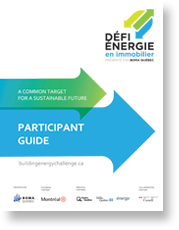 All details for the Energy Challenge are available in the Participant’s Guide, available here for download. Before you start, carefully read the guide. It also includes all the steps for creating an ENERGY STAR® Portfolio Manager account. Enter your data and share them with BEC. The BEC collaboration award commends collaborative practices, motivation, positive impacts and adaptability. The form specifies all the information required for submitting your candidacy. 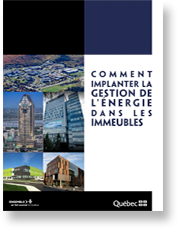 A guide for owners and managers of buildings and property holdings designed by Transition énergétique Québec and the Ivanhoe Cambridge Real Estate Chair (available in french only). Informative webinars to increase your knowledge and thus make the most of your BEC project. 6 good reasons to participate! How much does it cost to register for the Building Energy Challenge? Throughout the Challenge, measuring the performance of participants' buildings and making comparative analyses of energy consumption is carried out by means of the free, easy to use online tool from Natural Resources Canada: ENERGY STAR® Portfolio Manager. The Participant's Guide contains instructions for downloading and entering your data. Will my GHG emissions be revealed or made public? Not at all. BOMA Quebec will not share or publish a participant's data without his or her explicit consent. If you grant consent, your accomplishments might be shared with other participants and with the industry at large by means of special participant profiles, case studies, the BEC website, etc. Does the BEC also apply to shopping centres? In many cases we don't have access to 100% of energy consumption data due to the fact that some accounts are managed by tenants. We encourage tenants to also create their own Portfolio Manager account and to share their rental space with building owners and managers (in a group, as described in the guide). If managers are unable to get their tenants involved in the BEC, they can compete only in the indoor common area category. What information must be entered in the ENERGY STAR Portfolio Manager tool? •	Consult the Participant's Guide for more information. How can I obtain a weather normalized EUI if I don't know the energy consumption of my tenant(s)? In certain building categories, the building manager cannot have full access to the energy consumption figures for rented premises. Although preferable, they are not necessary to obtain a weather normalized EUI for the purposes of the BEC. You can submit incomplete energy consumption data if you do not have access to all the information. Indicate which sectors you are providing energy consumption data for, and enter the appropriate building floor area. Such buildings can still obtain a weather-normalized site EUI so long as you have provided data for 12 consecutive months. What are the basic performance measures used in the BEC? The measures of performance are energy use intensity (EUI) of the site, as well as weather-normalized energy use, and GHG emissions. How are energy savings verified? •	Visits of the site will be planned as needed. What sort of support will I receive from the BEC? The BEC will also offer participants training sessions, presentations and documents to assist you throughout the competition. Can I register in the Collaboration category if I don't have any tenants? Unfortunately, this qualitative section is only for owners whose tenants are involved in the BEC project and who are willing to demonstrate their commitment.